Every culture, and almost every household, has its own treasured potato salad recipe. 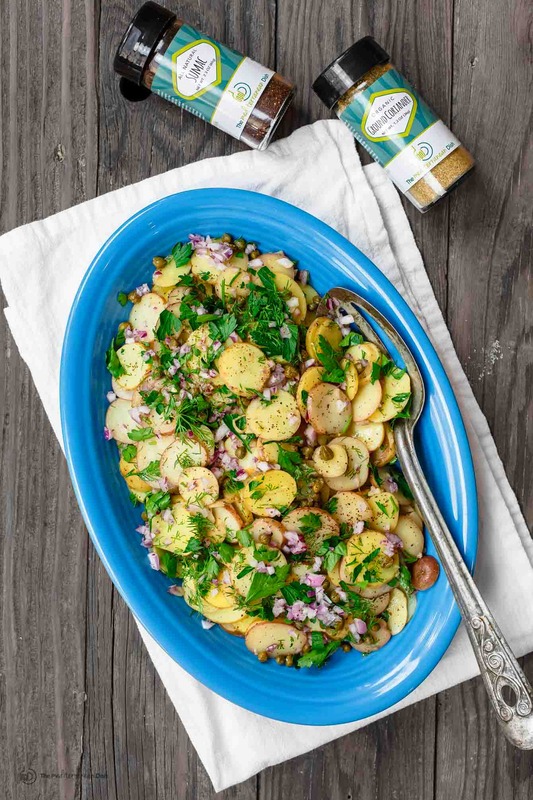 Mine is this mustard potato salad recipe; it’s one with Mediterranean influence, perhaps even a bit of French flare. 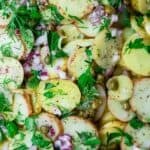 Why this mustard potato salad works for those who follow the Mediterranean diet isn’t hard to figure out. Firstly, this is a lighter, no-mayonnaise potato salad that relies more on quality extra virgin olive oil and Dijon mustard for a dressing. 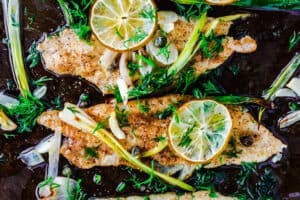 Favorite Mediterranean spices, onions, and fresh herbs, including dill–a forgotten herb that pairs especially well with potatoes–add flavor. And my absolute favorite part, capers. The tiny, salty, olive-like green things, add texture and tang. You can use green olives, pitted and finely chopped, instead, if you like. 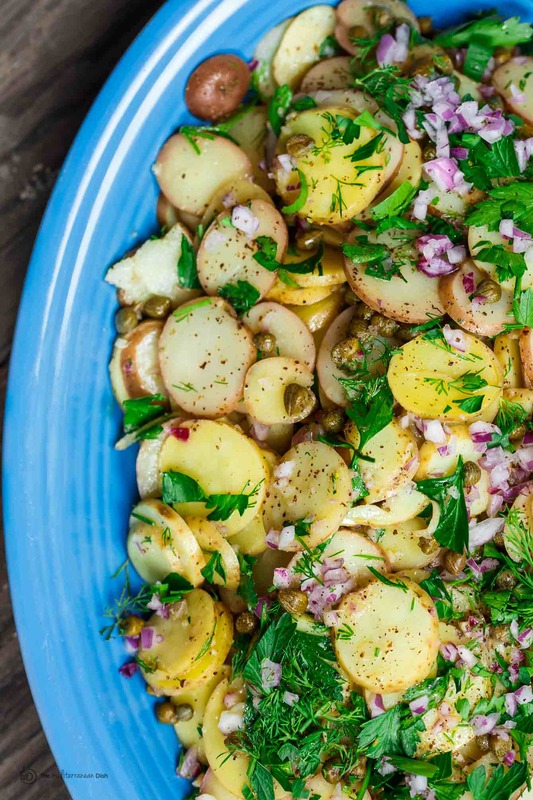 A couple tricks that make a difference in this mustard potato salad. First, slice the potatoes before cooking; this preserves their shape and texture. Secondly, to infuse the potatoes with flavor, pour the vinaigrette over while they are still warm and let them sit for 10 minutes or so. Wash and dry potatoes. Slice potatoes thinly using a mandoline slicer like this one. Place potatoes in a pot and add water to cover by 1 inch. Bring to a boil. Add salt and turn to simmer until potatoes are tender about 6 minutes or so. When potatoes are ready, remove from heat and drain. Place potatoes on a tray or baking sheet and immediately add the vinaigrette (while potatoes are warm), toss to coat. Let potatoes sit for 10 minutes until flavors meld. Add onions, fresh herbs, and capers. Toss gently to combine. Transfer potatoes to a serving dish or bowl. Serve at room temperature. 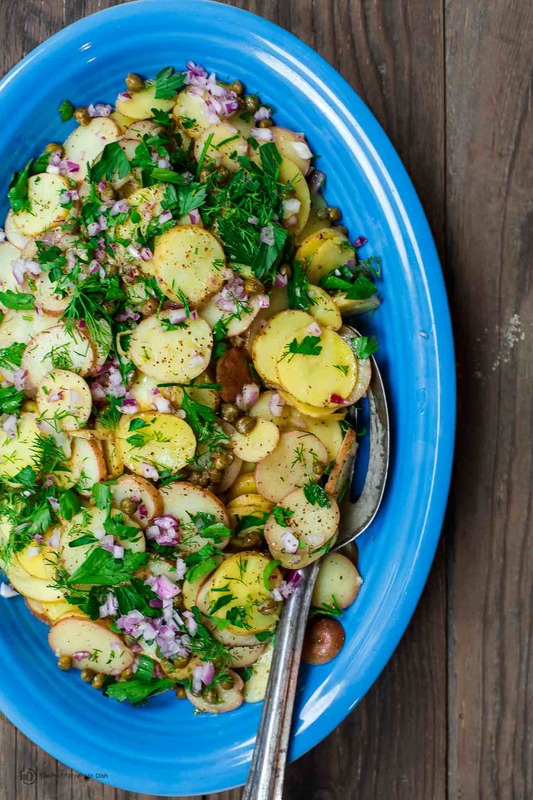 Make-ahead instructions You can make this mustard potato salad ahead of time. Dress the potatoes with the vinaigrette but hold the onions, herbs and capers until later. Refrigerate up to 8 hours. Before serving, add the onions, herbs and capers and toss. Bring to room temperature before serving. Recommended for this Recipe our Early Harvest or Private Reserve extra virgin olive oil. Sumac Spice; and Coriander . SAVE! 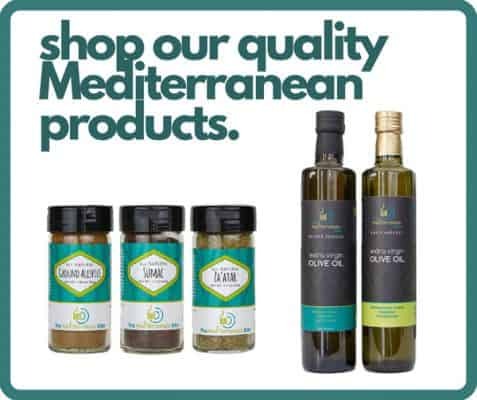 Try our Ultimate Mediterranean Spice Bundle, or create your own 6-pack or 3-pack of our all-natural and organic spices. I’m not finding ground sumac in our local grocery store. What would you suggest as substitute? There is not a good substitution for sumac, but you can omit sumac if you like and go for a different spice like cumin. It’ll be a different flavor, but still delicious. 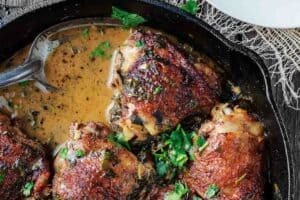 I love this recipe and it doesn’t last long at our house. 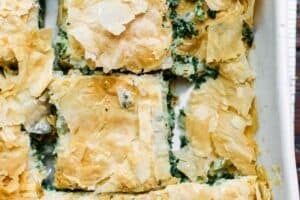 I don’t keep capers and fresh parsley on hand because I seldom use them but even without those ingredients this is a wonderful recipe. 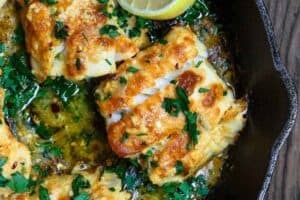 Do you ever wish folks would just once make your recipes the same way you do? This DELICIOUS dish deserves 10 stars! Added extra ingredients to make more dressing. 3rd time I made it cut the potatoes thicker, kept shape better.. Fantastic flavor!! My favorite!! It’s quite good. It’s even better when made the day before serving. Don’t know what the ‘make-ahead’ directions are all about. As it melds together, it gets even better. The 8 hours is a strange direction. Thanks for the yummy recipe. It does benefit from some sea salt. 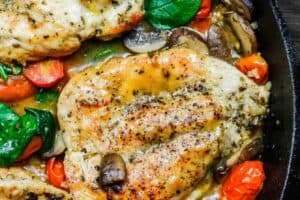 I made this recipe for my husband and I and we loved it! Will make it again! Thank you for sharing it! Awesome, Kim! Glad you enjoyed it!